Soaps are made in thousands of different varieties using different combinations of ingredients. Many soaps use water as a main ingredient, but there are many benefits to using unprocessed goat's milk rather than water. Many of the beneficial ingredients in goats milk soap come naturally in goat milk which would otherwise need to be added to water-based soaps. Goat's milk weakens the bonds affixing dead skins cells because it naturally contains alpha-hydroxy acids that aid in the removal of dead skin cells leaving a smoother, more youthful-looking skin surface. Some water-based soaps use harsh chemicals to achieve this same result, which can lead to harmful effects on skin. Goats milk is high in vitamin A which helps nourish and repair skin. Studies have shown that Vitamin A can provide numerous healthful effects on skin conditions such as acne, wrinkles, and some lessening of psoriasis. Although some water-based soaps have been artificially fortified with vitamins, most aren't. 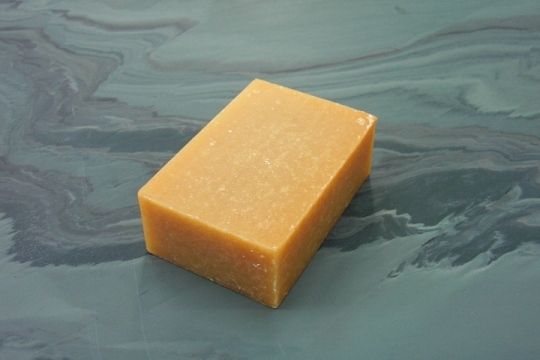 The fat molecules in the milk creates the creaminess of goat milk soap which increases it's moisturizing quality. It does not dry out your skin, but rather keeps your skin naturally moisturized to maintain your skin's health. Along with many naturally occurring vitamins, goats milk also contains beneficial minerals. Selenium is often used in anti-dandruff shampoos to kill the scalp fungus that causes shedding of dry skin fragments and is naturally present in goat's milk. Water based soaps do contain some minerals such as calcium, sodium, or iron, though those minerals don't provide much value for your skin. We are in the process of redesigning the packaging for our handmade goats milk soap and will update this page when we re-launch.